Nearly nine years ago, after apartment searching for a little over a month, I found a one-bedroom about 3 miles north of the beach. The place had lots of light, would take pets without requiring a deposit and was very reasonably priced. I was in a chaotic situation, staying with a friend who had a husband, two sons, two dogs, three cats and two birds. My cats and I were very eager to get out on our own and have our own space. The apartment turned out to be in a slightly shady part of town, a fact I was completely oblivious to when I moved in. The building was on a busy street where many car accidents took place. I got very used to calling 911 without hyperventilating, a skill I never expected to learn. The worst incident I had to report was when a woman was hit by a car, but even that was trumped when just last year a drunk driver dragged a small child under his SUV for 5 blocks and finally stopped a few buildings down from mine. Even with all the drama in the neighborhood, it was hard to get motivated to leave. I felt comfortable in my space and always felt safe. I got to know my neighbors fairly quickly and spent time hanging out with them. In my early years at the building we’d have barbecues around the pool, getting drunk and having fun. We’d look out for each other, share food, watch each other’s pets. I saw one woman’s granddaughter grow from a toddler to a beautiful young girl, while another neighbor’s kids graduated from high school, then college. One neighbor got married and divorced all during her tenure at the building. And even when people moved out and moved on, there were new people to take their place, some of whom have become very good friends of mine. Truth is, I’d known for several years I needed to leave. Although the landlord was a pleasant man and very compassionate when I struggled to pay my rent, the building was a dump and he was too cheap to do the necessary upgrades. In the last few months of living there I was finding termites, as were several of my neighbors. The neighborhood was going ghetto and as a result the energy in the building had shifted. I’d shifted as well, into a place where I was no longer willing to tolerate the shabby environment I was living in. But leaving behind the home I’d lived in the longest since I’d left my parents’ house was harder than I anticipated. I had experienced so much there: I watched the World Trade Center fall while I stood in my living room, staring at the TV in complete shock; I celebrated and mourned the news of my divorce; I fell in and out of love; I let go of one cat only to make a home for a new one a few years later. I would pack and unpack boxes every few years, thinking, “if I pack it, the new place will come,” but I was not ready to let go. It took a layoff in early 2009 and more than 14 months’ unemployment for me to accept that it was my time to leave. As much as I liked having a place of my own, I was now going to be the one to move out and move on. 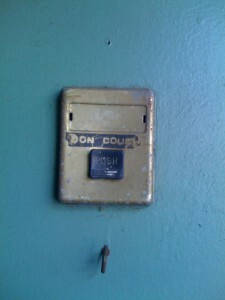 When I moved in, I noticed that the name of a former tenant, Don Couch, was on the door. I can picture him using a Dymo label maker to punch out his name and affix it to the gold-tone plaque surrounding the doorbell. When he removed the label, though, the adhesive left an outline of his name, forever associating him with the apartment. Oddly enough, it wasn’t until a now-ex-boyfriend came to live with me that I actually looked for Don Couch on Google. I found listings in Maui and San Francisco, so I don’t know for certain which one is the same Don Couch who lived in my old apartment. I like the idea that “my” Don moved to Maui, because it gives me some hope for my own future, one where I am living in beautiful surroundings, with a career I love. Nope, Don Couch doesn’t live here anymore. And now, neither do I.